Orlando, FL – America’s most iconic sports car, the original Ford Mustang, is back in production, better than ever. 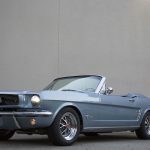 The first true replica of the Mustang, looking just as stunning as the original, but with modern powertrain and technology is being launched by Revology Cars, a specialty automobile manufacturer based in Winter Park, Florida. Numerous details highlight the effort to maintain the integrity of the original design, including power windows activated by pushing or pulling on the original window crank handle, an electronic instrument cluster with message center and LED lighting integrated into the original five-dial bezel and USB and AUX jacks hidden in the ashtray. 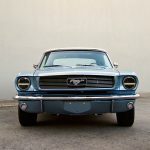 While the exterior and interior of the Revology Mustang strive for an original appearance, the car’s underside and engine bay depart dramatically from the first generation model. “The powertrain and suspension are all-new,” says Nathan Loucks, vehicle integration supervisor. 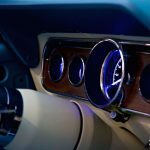 The Revology Mustang replica is powered by a fuel injected 5.0L V- 8 engine, featuring a modern electronic engine management system. An electronically controlled automatic or a manual transmission can be specified. The front suspension is MacPherson strut and the rear end is a three-link design, developed by supplier RRS of Australia specifically for this application. 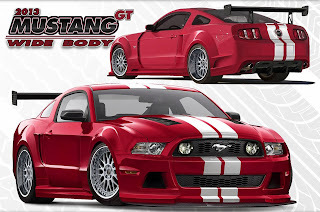 The three-link design offers an excellent balance of performance and ride quality, which is a key reason the design was used on the Ford Mustang from 2005 until the introduction of independent rear suspension in 2015. Power four-wheel disc brakes inspire confidence, while standard power rack and pinion steering provides excellent feedback. Modern creature comforts abound, including remote keyless entry, power door locks, power seats, tilt steering column, intermittent wipers, digital message center, remote trunk release, and even Bluetooth, all carefully integrated into the interior to be minimally intrusive. The Revology Mustang replica has many active and passive safety features that were not available on the original Mustang, including LED lighting for better visibility, four wheel disc brakes, a dual chamber master cylinder, radial tires, rack and pinion steering, side intrusion beams, collapsible steering column, three-point seat belts, and a fuel pump inertia shut-off switch. Underscoring Revology’s emphasis on quality, reliability, and durability is the fact that every new Mustang replica comes with a one-year, unlimited mileage bumper-to-bumper warranty. Additional coverage on powertrain components extends to three years, and the body is covered against rust and corrosion for five years. The Revology Mustang replica base price is $119,500 FOB Winter Park, FL. It is available in both convertible and fastback body styles. Revology Cars is accepting orders now for delivery in Spring 2016. Please call (800) 974-4463 or visit www.revologycars.com for details. 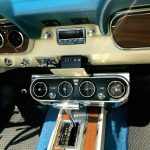 This entry was written by by 67mustangblog.com (67mustangblog) and posted here on Sunday, May 17th, 2015 at 8:08 am and is filed under Mustang Builders, News, replica, Revology. This article was not written by us, rather gathered using RSS feeds listed here. We take no credit for this article. You can leave a response, or trackback from your own site.